Pure Nepal has put together a packing list for you. Request our free packing list! I’m going to travel alone and would prefer not to be put in a group. Is that possible? Yes. Pure Nepal organizes trips for individuals, small groups or larger groups. Trips are always tailor-made! Why should I have a guide during my trek? A guide has experience in the mountains, knows the way and can assess risks properly. He knows the right places for you to find accommodation and helps in emergencies. It’s not always possible to quickly get to a hospital or healthcare facility on the trekking routes. Your guide can adequately assist in emergencies. Your guide can also tell you a lot about the area you are traveling through. Is a carrier also necessary? Carriers are used to walking in mountainous areas of Nepal with heavy loads. Even when they’re home there often isn’t another way to transport things. The carrier earns money doing this job which he can use to support his family. Meanwhile, you can enjoy the trek without a heavy load on your shoulders. 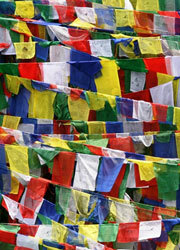 With Pure Nepal you can be sure that the guides and carriers earn fair wages and are insured. Can I get money from an ATM in Nepal? There are various ATMs in both Kathmandu and Pokhara where you can make a withdrawal. Not all places accept credit cards. Which vaccinations are required for a stay in Nepal? We cannot advise you on this subject. You should contact your family doctor well before your trip. Do I need anti-malaria medication? You’ll also need to contact your family doctor about this. Anti-malaria medications are normally only necessary if you want to visit Chitwan National Park or if you’d like to combine your trip to Nepal with one to India. Yes. There are international hospitals in Kathmandu. We can accompany you there, with transportation by helicopter if necessary. Be sure that you’re well insured! How do I get safe drinking water in Nepal? Always purchase well-sealed bottles of mineral water. You can refill bottles at reliable locations, including our Kathmandu office. We’ll gladly inform you about water purification options. Can I purchase food from street vendors or local restaurants? Be very careful with what you eat. Traveler’s diarrhea is very common in Nepal. We do not recommend ‘food from the street’, including fruit that is cut or peeled. Never eat ice cream from the ice cream carts! Are fly-drives available in Kathmandu? No. Only cars with a driver are available for rent in Nepal. What is the difference between a local bus and a tourist bus? Tourist busses are not allowed to carry more passengers than there are seats in the bus. Local busses are always packed full (including the roof). The local bus drivers have a less cautious driving style. Plus the technical quality of tourist busses is better than the local busses. They will also stop at ‘tourist restaurants’ for breakfast or lunch. Tourist busses are very affordable and local busses even more so. We recommend tourist busses, especially for long trips! I would like to see a lot of the country in a short time, which form of transportation do you recommend? You can take domestic flights to various destinations.